One of the most prestigious and grueling racing events held is the "Le Mans 24 Hour Endurance Race". It has brought excitement and pleasure to motorsports enthusiasts worldwide, ever since it was first held in 1923. 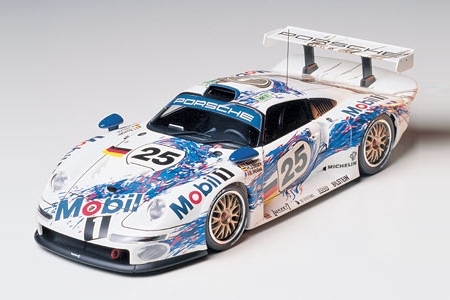 In 1996 Porsche, who had been idle in motorsport competitions as a works team since their withdrawal in 1988, announced their intention to come back to the Le Mans 24 hour endurance race with their latest Porsche 911 GT1. Although the styling of the GT1 retains some resemblance with their conventional 911, it is not the usual 911 but a highly advanced pure racing version. The low and sleek body shell was a product of numerous wind tunnel experiments. An air intake on the roof and air outlets at either side of the rear contribute to obtain outstanding aerodynamics. Its 3.2 liter water cooled, horizontally opposed six-cylinder engine produces and awesome 600 plus horsepower output, coupled with twin-turbochargers. The rear suspension has long A arms connected directly onto the gear case via pushrods just like formula cars. Front and rear 18 inch wheels are fitted with wide racing slicks, and power assisted carbon discs with ABS provide positive stopping power. In spite of its exceptionally short developing period of only 8 months, the Porsche 911 GT1 gained respectable second and third places in the 1996 Le Mans event, bringing motorsport glory back again to Porsche.